It’s high time I got back to writing. After five weeks on the road and a family reunion week, I have finally carved out some time to pursue my craft. And I’m headed to my favorite and most productive writing venue, Amity Coffee. There I can escape the distractions of home and focus on the words assembling on my computer screen amidst the buzz of conversation and the cacophony of sounds involved in preparing elaborate coffee drinks. I am anxious to get rolling. But it feels all wrong. Sunshine has replaced the earlier showers. The fresh clean outdoor air contrasts with the closed atmosphere of my beloved coffee shop. Most of all, the lake beckons. The shop may not be for me this morning, but I’m not about to deny myself that latte. “To go, please,” I append my order. My joy in walking back outside affirms my choice. I find just what I’m seeking a mere mile from home. Rocks. The Rocks, of Brighton Beach. Big boulders where I can nestle into a chair-like cranny. 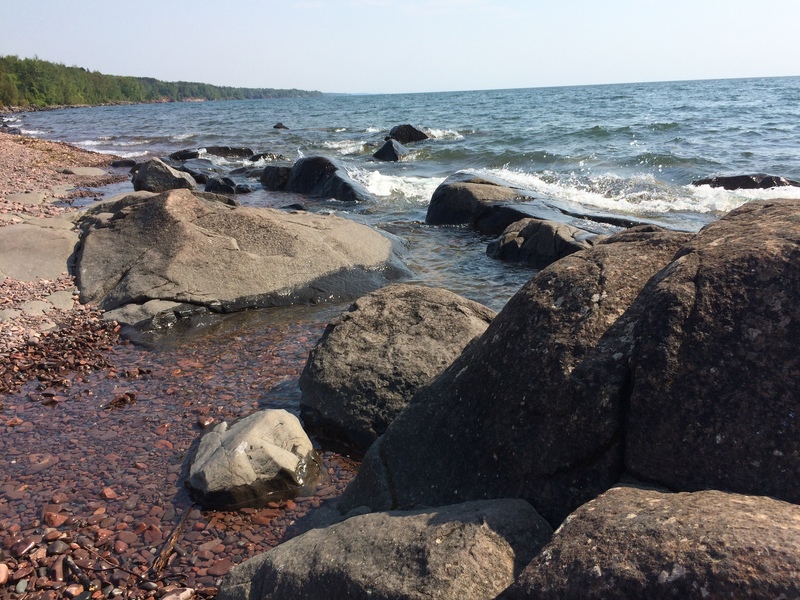 The morning’s wind has stirred up the lake, delivering endless waves bouncing off said rocks. The sound alone is enough to envelope me. I feel the solitude despite others clamoring among the rocks around me. The wind on my face is refreshing, offsetting the warmth of the sun pouring down. I was right to come here. I forgot my sunglasses. Neglected to bring my camera. But I remain. I procrastinate by trying to capture the splashes with my cell phone. Pen and paper replace my usual keyboard and screen. And it feels good. The tactical exercise of forming words manually is in harmony with the natural elements that surround me. It is yet to be seen what I can accomplish on my self-assigned writing task. But I enjoy the moment. I will return to my coffee shop another day. Today, I just couldn’t do it. 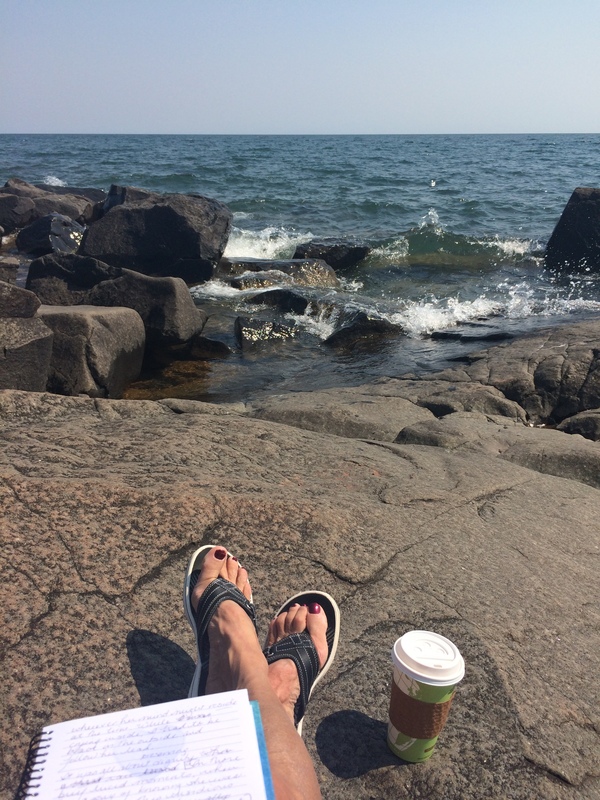 This entry was posted in Writing and tagged Lake Superior, Writing by Molly. Bookmark the permalink.